Adding to rumors that Apple is seriously considering a larger iPad model, a Chinese website on Tuesday claims Foxconn has built five prototype versions of the alleged 12.9-inch tablet featuring 2K or 4K screen resolutions. Citing a people familiar with the matter, Chinese publication PadNews claims Apple is testing five different 12.9-inch iPad models built by partner manufacturer Foxconn. Further, the company may launch a version with a 2K resolution screen in the first half of 2014, then debut an even higher resolution 4K model a few months later. The publication quotes sources as saying the first of the larger iPad models could hit store shelves in April, with the 4K ultra-HD iteration coming during the regular iPad product update cycle in October. While the terms "2K" and "4K" were tossed about in the report, it made no mention of specific panel resolutions. Currently, the iPad Air boasts a 9.7-inch Retina display with a 2,048-by-1,536 pixel resolution, which by many standards is already a 2K panel. 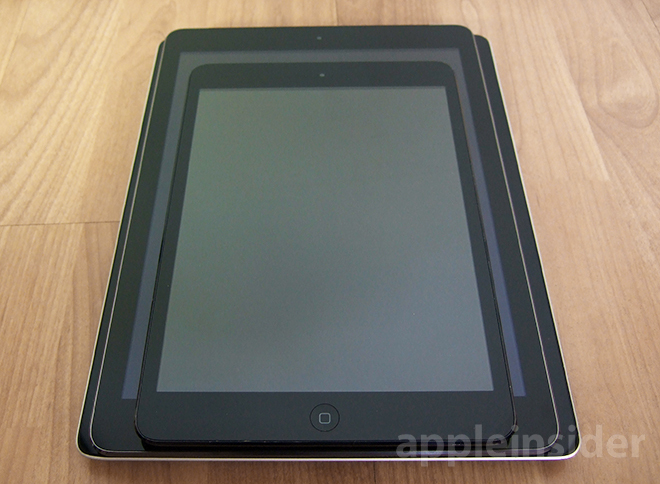 Tuesday's rumor is not the first suggest Apple is building a larger-sized iPad. In November, a report from The Korea Times cited an official at a local Apple parts supplier as saying the 12.9-inch Retina display was already being manufactured by a "first-tier" Korean display maker. Earlier that month, the source of today's rumor said Apple was in advanced testing of either an 11.4-inch or 12.9-inch tablet. Finally, separate reports from The Wall Street Journal and Chinese publication United Daily News claimed a larger iPad was in the works. As tablets continue to take over the PC landscape, Apple could be looking to stay ahead of the curve with additional screen size offerings. A 12.9-inch iPad panel would come close to the company's smallest MacBook Pro and surpass the 11.6-inch MacBook Air thin-and-light.